The R ecosystem knows a ridiculous number of time series classes. 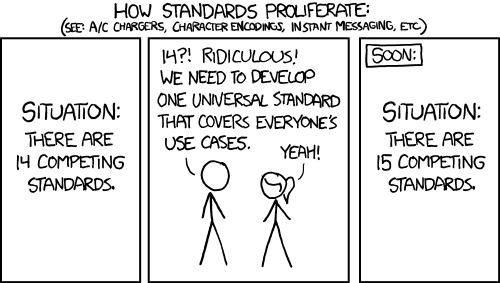 So, I decided to create a new universal standard that finally covers everyone’s use case… Ok, just kidding! 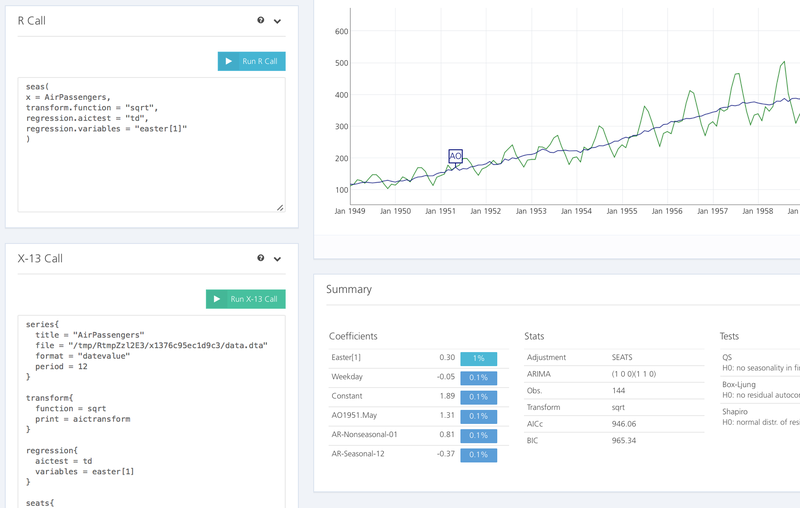 This entry was posted in R and tagged R, time series on May 15, 2018 by usefulr. Similarly to the United States, public data in Switzerland is produced by a large number of different offices, which makes it hard to find any particular series. dataseries.org provides a structured and automatically updated collection of most of these series. We are still working on the data input, but are pretty much complete in the field of Economics. 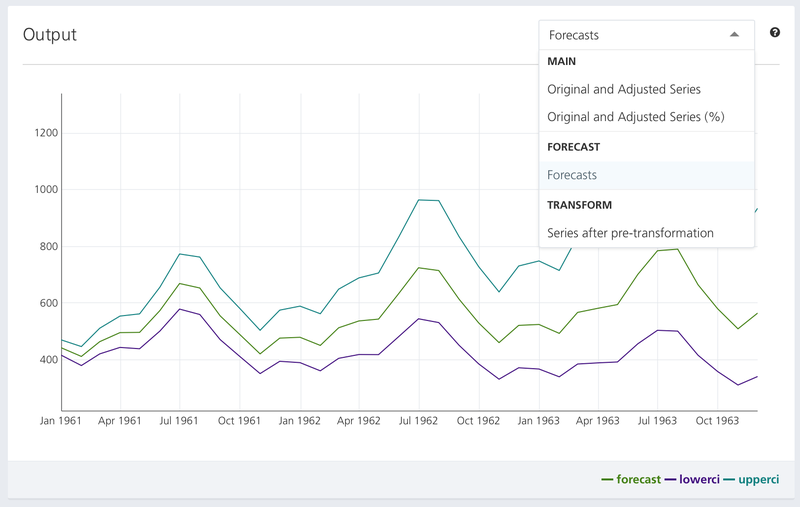 In the following, I will use data from dataseries.org to produce a live forecast of Switzerland’s GDP. Each day the model is run, it will be ensured that the latest data is used. That way it is possible to produce a transparent and up-to-date forecast. For the following exercise, I will only use tools from R base, but it is of course possible to use the same data in a more advanced modeling framework. In order to produce a reasonable forecast, we want to track early information on the business cycle, which is mostly survey data. We will use a question from the SECO Consumer Confidence Survey on current economic performance, the Credit Suisse / Procure Purchasing Managers’ Index and the ETHZ KOF Barometer. A plot of these series shows the common trend in these variables and gives you an indication of the business cycle, which may have turned upward in recent months. If you need advice on which ARIMA model to choose, the information criterions, accessed by the R functions AIC or BIC, can help you to choose a model. Simply take the model with lowest information criterion. The auto.arima function from the forecast package also allows you to do the selection automatically. The model’s forecast for the first quarter of 2017 is 0.7 – a value that hasn’t been reached for more than two years. If you have multiple indicators at hand, a common problem is multicollinearity, the fact that indicators are correlated, and therefore too many indicators deteriorate the quality of the model estimation. Publication of first quarter GDP is on June 1, 2017. See you in a month! This entry was posted in R and tagged R, shiny, Switzerland, time series on May 3, 2017 by usefulr. 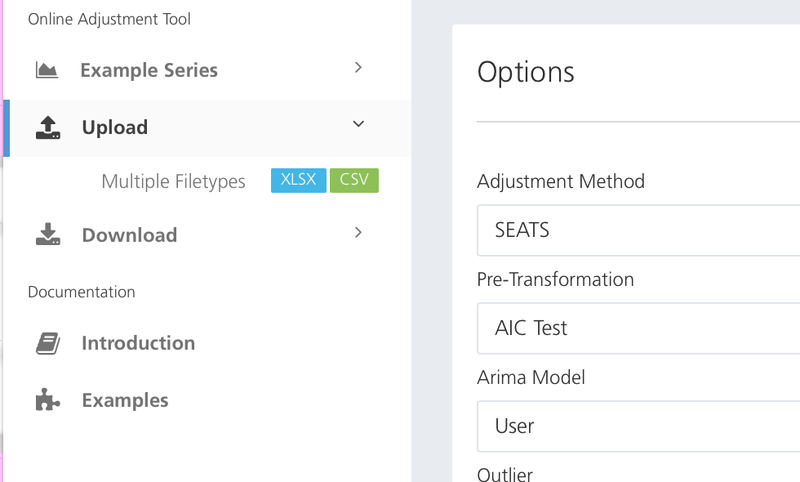 The R package seasonal makes it easy to use X-13ARIMA-SEATS, the seasonal adjustment software by the U.S. Census Bureau. In a previous post, I wrote about www.seasonal.website, a Shiny-based website showcasing the use of seasonal. Even if you are not using R, the website allows you to upload and adjust your own series, without the need for any software installation. The main new feature is a live parser of X-13 spc files. Changes in the Options, triggered by the pull-down menus, or changes in the R Call, are reflected in an updated X-13 Call. On the other hand, changes in the X-13 Call will be reflected in updates in the Options and the R Call. Non-R-users may use the website to generate spc files, which they can use in any software that includes X-13ARIMA-SEATS. People familiar with X-13 may use the spc syntax to learn about the syntax of the R-package seasonal. People familiar with the R-package seasonal may use it learn about the spc syntax. The upload/download feature has been reworked. A button on the top-right corner opens a new upload and download dialog. Both XLSX and CSV formats are supported. 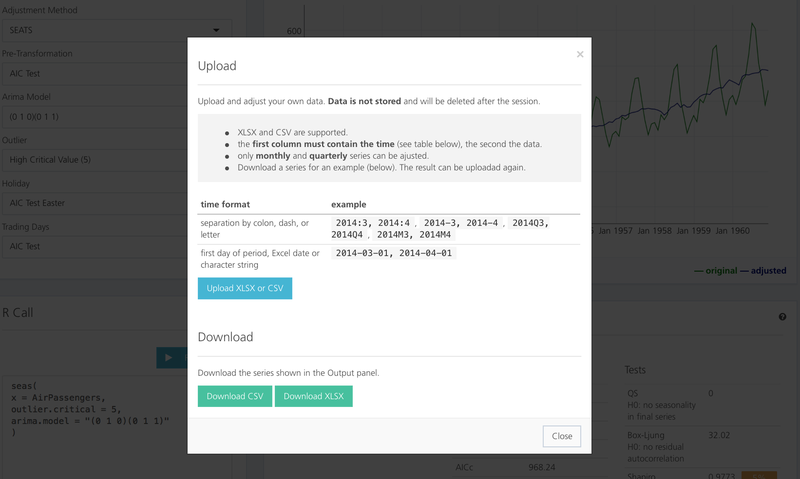 You can upload and adjust your own monthly or quarterly time series. All data will be permanently deleted after your session. The summary, previously just the printed output of the R-function summary, has been overhauled. Colored flags indicate the significance level of the coefficients, reddish colors indicate warning signs from the tests. This entry was posted in R and tagged R, seasonal adjustment, shiny, time series on September 29, 2015 by usefulr. Seasonal adjustment of time series can be a hassle. The softwares used by statistical agencies (X-13, X-12, TRAMO-SEATS) have tons of fantastic options, but the steep learning curve prevents users from taking advantage of the functionality of these packages, or from using them at all. A new shiny based website is showcasing the use of seasonal and allows for online adjustment of time series, without the need to download and install seasonal. The AirPassengers series is set as the default series, but can be replaced by any uploaded series. There are other demo series that show the use of the software to adjust Indian Diwali or Chinese New Year effects. The site allows to adjust most parameters of X-13, and to view and download a substantial part of its output. Frequently used options can be chosen from a drag and drop menu, while less often used options can be chosen by manipulating the R-Call itself. Frequently used options of X-13 can be modified using the drop down selectors. Each change will result in a re-estimation of the seasonal adjustment model. The R-call, the output and the summary are updated accordingly. A substantial part of the output of X-13ARIMA-SEATS can be shown on the website. Click and drag to zoom into the graph. Double click to restore the original view. The R-Call to seasonal can be modified and run online. In the picture below, the ARIMA model has been adjusted to include an autoregressive parameter of order 2. Press the button to execute the modified call. User defined series can be uploaded, importing from Excel or CSV. Also, all viewable series can be downloaded as Excel or CSV. Chinese New Year or Indian Diwali support is included out of the box and can be selected from the drop down menu. Adjustment for these holidays is as easy as adjusting Easter effects. The examples from the official manual of X-13 can be run directly on the website. The collection of examples can found here. 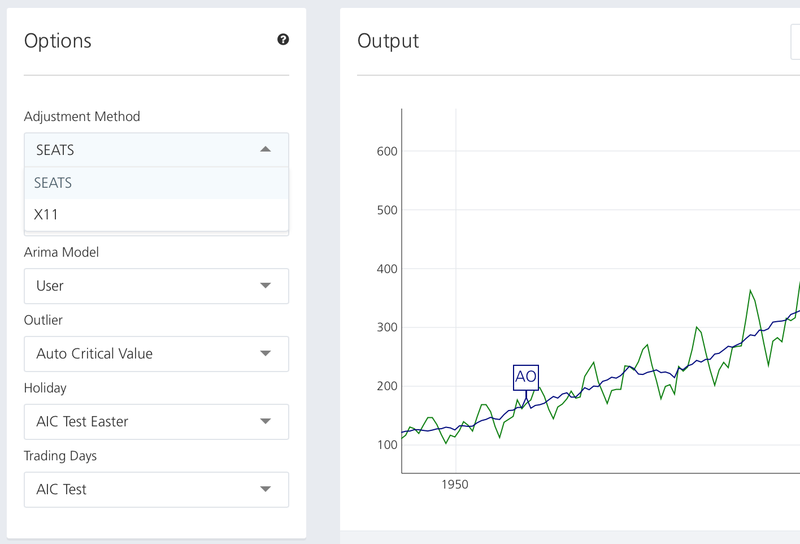 This entry was posted in R and tagged R, seasonal adjustment, shiny, time series on March 20, 2015 by usefulr. The Spring Festival is the most important holiday in China and many other Asian countries. Traditionally, the holiday starts on Chinese New Year’s Eve, and lasts to the Lantern Festival on the 15th day of the first month of the lunisolar calendar. The Chinese New Year is celebrated either in January or in February of the Gregorian calendar. Because of its importance, Chinese New Year seriously distorts monthly time series, which are usually reported according to the Gregorian calendar. Unlike Easter, Chinese New Year does not affect quarterly time series, as it always falls in the first quarter. The standard software packages for seasonal adjustment, X-12-ARIMA and X-13-ARIMA-SEATS (developed by the U.S. Census Bureau) or Tramo Seats (developed by the Bank of Spain) have a built-in adjustment procedure for Easter holiday, but not for Chinese New Year. 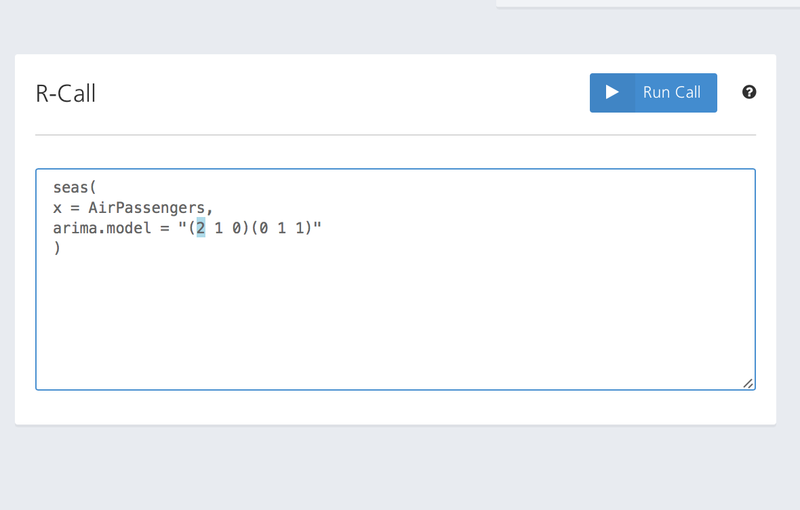 However, all packages allow for the inclusion of user defined variables, and the Chinese New Year can be modeled as such. 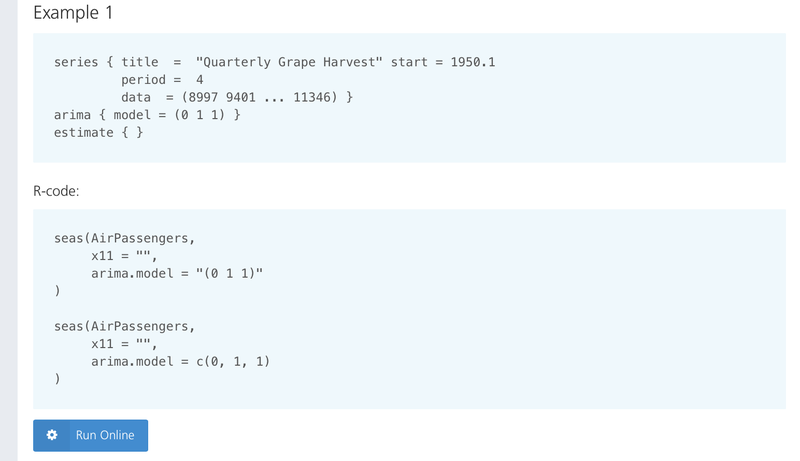 With the R package seasonal, generating and including such a series is easy. We will use it in the following to seasonally adjust and remove Chinese New Year effects from the nominal dollar value of imports to China. seasonal is an interface to X-13ARIMA-SEATS; for more information and installation details, see here. 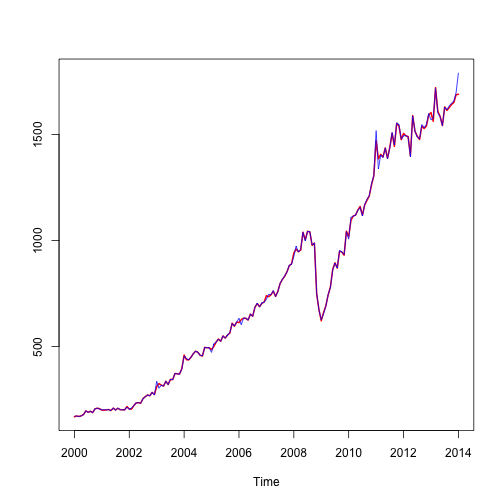 seasonal includes the genhol() function, a R version of the equally named software utility by the U.S. Census Bureau. Using the dates of the Chinese New Year as an input, it produces a time series with the deviations from the monthly means. Here we are assuming that the holiday starts on New Year’s Eve and lasts for one week. In 2014, only two days in January were affected by the holiday (New Year’s Eve and New Year’s Day). 75% of the holiday fell into February. Thus, January was affected slightly less than average, February slightly more. This is very different from 2012, when the holiday completely fell into January. With xreg, arbitrary user defined regressors can be included, regression.usertype = "holiday" ensures that the final series does not include the regression effect. We also have chosen X11 as the decomposition method. Unsurprisingly, the summary reveals a highly significant Chinese New Year effect. As the automatic model has been estimated on the logarithmic series, the coefficient of -0.18 indicates that New Year in 2012 has lowered imports by approximately 0.74 * 18 = 13%. The automatic procedure has also detected weekday effects and a level shift during the financial crisis. There are actually two kind of New Year effects: Until New Year’s Eve, import activity is higher than usual. During the holiday, it is lower. By including two regressors, these opposite effects can be modeled. 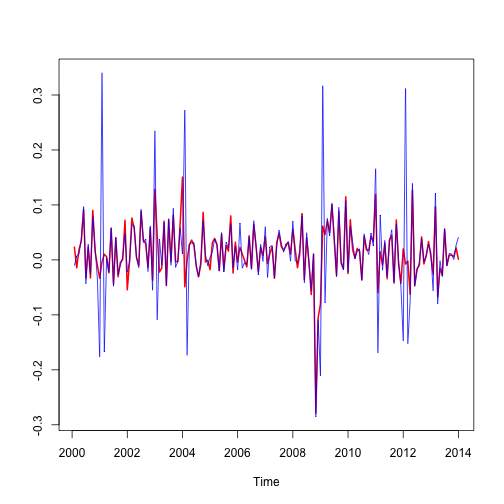 Note that the negative effect is more pronounced than the positive one. The model could be further refined. With the static() function, a non-automatic version of the previous call can be extracted. It can be copy-pasted and used for further manipulations. ##     x11 = list(), regression.variables = c("td1coef", "ls2008.Nov"
It’s far form perfect. Normality statistics are bad, and there may be some traces of autocorrelation. On the other hand, the seasonal component is stable and revisions are small. In 2012, we would have concluded that imports have plumped in January, soared in February and plumped again in March (blue line). With the adjustment, we rightly conclude that there was no such craziness (red line). How useful is the two regressor model? Most of the time, the single regressor model performs reasonably well and leads to results similar to the two regressors model. This year, however, the Lunar New Year fell on January 31. As people were importing more in the pre-New-Year period, January imports were actually affected by a positive New Year effect. The right adjustment would be to correct the numbers downward! With the one regressor model, we would wrongly conclude that imports have soared (blue line). In fact, they have actually stagnated (red line). This entry was posted in R and tagged China, Chinese New Year, R, seasonal adjustment, time series on February 17, 2014 by usefulr.